Author of The Devils Dictionary, Can Such Things Be? and An Occurance at Owl Creek Bridge, Bierce was born in Ohio to religious parents. He was not a freemason although his uncle Lucius Verus Bierce was Grand Master of Ohio for 1853-1854. 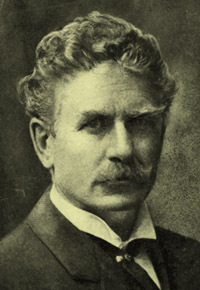 One time editor for the San Francisco News-Letter and California Advertiser (1868-72), Bierce is best remembered for his cynical but humourous Devils Dictionary, in which he had nothing favourable to say about Freemasonry. In 1913 "Bitter Bierce" disappeared into revolution-torn Mexico to fight alongside the revolutionary Francisco "Pancho" Villa. He probably died in the battle of Ojinaga on January 11, 1914.